Some places radiate disaster as soon as you cross the threshold. Such was the case with Cafe Cornucopia, which took over when Appetite Direct closed their shop on Howe Street to focus squarely on their catering business (although saying that, they’ve just taken over the cafe at the Festival Theatre). I was unsurprised to see Cornucopia quickly closed, to bereplaced by an interesting looking Italian called Nova Pizza – Vegetarian Kitchen. I popped in to check it out. In the traditional Italian style, with chequered tablecloths and quite minimal detailing, it’s a nice informal space that feels well suited to lunch service. They’re still bedding things in but I found it quite charming. Their menu features pizza at the heart of things, but I was lured in by talk of mushroom bruschetta and aubergine pasta so ordered them instead. I’ll come back for the pizza another day. Service is very friendly but, for now, slow. They’re cooking dishes to order, which is great, but it looks like they need an extra of hands as the two fellas running both the kitchen and front of house were rushed off their feet with a half-filled place and relatively steady takeaway trade. My bruschetta was with me soon enough, looking rather tempting. 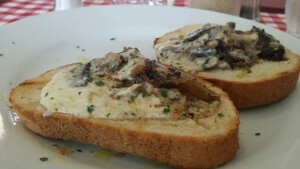 It proved really tasty with lovely creamy mushrooms atop nicely toasted bread. It got a firm thumbs up. 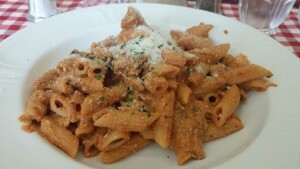 The pasta was every bit as good, with a lovely tomato and ricotta sauce holding accurately cooked penne and profuse, flavourful aubergine. As per the subtitle to their name, the entire menu is vegetarian. Talk of Quorn pepperoni frankly terrrifies me, but everything I tried was fresh and spot on. 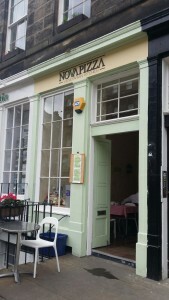 So overall, Nova Pizza is a great new addition to our Edinburgh dining family. There’s some polish to be applied to the setting and service, but the food is impressively tasty. I look forward to many future visits. Quorn Pepperoni terrifies me too, but this looks like a place to investigate! Thank you very much for this recension!We also have vegan pepperoni and i invite you to try! But never mind all that tedium… PIZZA! Wow! Went off your recommendation and have been 2-3 days in a row now! You have to try the Quattro Formaggi pizza. Best I have ever had!